Friday the 13th was the day I was waiting for so long. Sounds strange becouse many people see the number 13 asociated with friday a very unlucky day. I do not belive in superstitions thereford for me it was`t a bed day, but the opposite. Julie, friday 13th 2012, was the day I finished the master in human resources witch I did it after three years off college and that lasted no more and no less than two years. A total of five years....beautifule can i say , five years since I`m in the city of roses, Targu Mures, a city where I met a lot of beautiful people, I made myself friends but also antipathies. 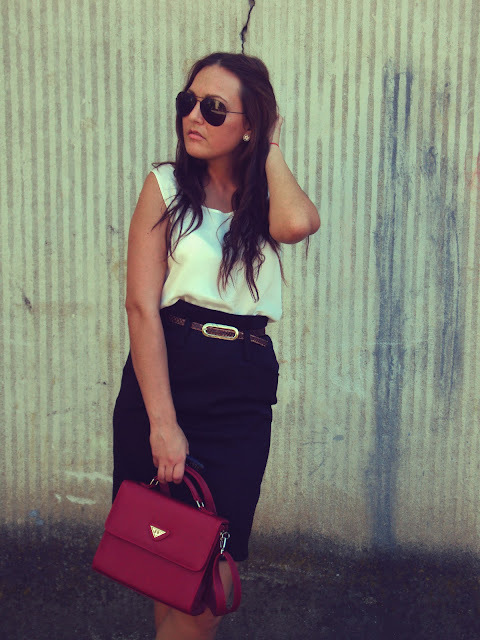 I was wearing an Stradivarius formal high waisted skirt, silk top and a lovely vintage bag. The look I created gives an air of style, of a bussines women (budding) ..haha. The sandals I bought them from Leonardo a few years ago and I don`t regret the purchase at all.